The expansive growth of the F&B sector has been the benefactor for many a business to garner appreciable remuneration. Tartaric acid market, in this regard, is one of the many verticals that has depicted quite an appreciable growth rate, pertaining to the product’s rising deployment in a wide variety of consumable products. Say for instance, it is popularly used in winemaking as a key element for maintaining wine stability, odor, color, and taste. What’s more, of late, consumers have been giving preference for natural wine with respect to health demands, which may have quite an impact on tartaric acid industry share. In addition, the product finds a plethora of uses in the food and beverage sector as a prominent preservative and anti-oxidant, providing a viable growth avenue for stakeholders. Numerous authorized organizations have enforced a slew of norms with regards to the usage of additives in the F&B sector. This in consequence, may have quite a transformative influence on tartaric acid market trend. In Europe for example, the EU has enlisted a set of additives deemed to be the safest to be used in food manufacturing. The European Food Safety Authority (EFSA) has also played an appropriate role in composing the food additive list, finalizing the maximum number of additives allowed in different food products. 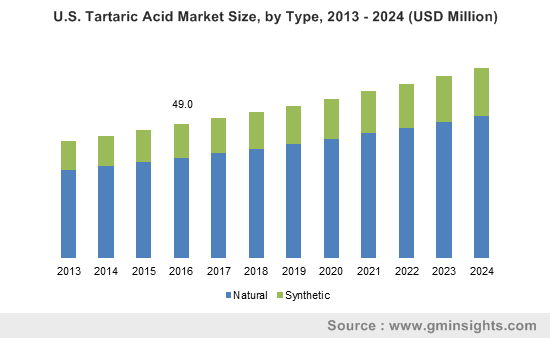 Tartaric acid falls among the top of this esteemed list, opening up several avenues of growth for its market in Europe. Incidentally, tartaric acid is found naturally in bananas, apricots, tamarinds, apples, and grapes. Having recognized the potential benefits of this organic acid, consumers have increasingly been preferring natural tartaric acid-based products to provide a boost to their health. Given the product’s exponential demand among health-conscious consumers, natural tartaric acid industry is poised to register an annual growth rate of more than 3% over 2017-2024. Elaborating further about health benefits of consumption of tartaric acid, it is vital to mention that it is rather useful in the maintenance of the immune system. Owing to its anti-inflammatory and anti-oxidant properties, it is massively used to resolve intestinal and digestion related problems. This in consequence, has led to the healthcare domain falling among the end-use spectrum of tartaric acid market. In this regard, many of the pharmaceutical companies have been on the go to use it as a primary constituent in numerous medicines. This has brought forth the inception of a lucrative application ground for tartaric acid industry players. In addition to medical applications, in recent times, tartaric acid has also been used as an anodizing agent for corrosion protection process. The principal reason behind the extensive use of tartaric acid for coating purposes is its excellent adhesion properties. Considering its functionality benefits, the leading aircraft maker, Airbus has recommended the Tartaric Sulphuric Acid (TSA) anodizing process for applying corrosion resistance coatings over various aerospace components. Indeed, REACH has also approved TSA anodizing process as an alternative for the chromic acid anodizing process, pertaining to the fact that TSA coatings are more environment-friendly. The deployment of TSA coatings falls among the transformative developments underlining the aviation industry lately. Having recognized the potential benefits of this acid, aircraft manufacturing companies have been establishing new aerospace processing plants where they intend to deploy TSA processes. For instance, the global leader in the aerospace industry, Magellan Aerospace, and the growing aerospace manufacturing company, Aequs, recently planned to expand their JV plant at Belgaum in India. In this unit, they apparently plan to carry out cadmium plating and Tartaric Sulphuric Acid (TSA) anodizing processes for OEMs in the aerospace sector. The aforementioned instance further validates that aerospace domain has emerged as a highly viable application avenue for tartaric acid market. All in all, the changing preferences of consumers toward health-centric food products and the high demand for drug delivery systems are certain to impel the revenue graph of tartaric acid industry in the forthcoming six years. As per estimates, tartaric acid market size is set to surpass USD 600 million by 2024.